Hundreds of migrants rushed the southern United States border in California on Nov. 25, while chucking projectiles at Border Patrol agents. They were pushed back by tear gas and some will be deported by Mexico. Hundreds of people rushed the border, dismantled part of the fence, and began streaming through the opening. But they were pushed back by tear gas launched by United States officers as they tried to cross a second wall. Mexican Interior Minister Alfonso Navarrete said that the migrants were encouraged by some of the caravan’s leaders to rush the border. The group managed to bypass a security cordon and scrambled to try and dismantle the fence and illegally enter the United States. Some 2,000 migrants participated, a Mexican federal police officer at the scene told The Epoch Times. Now Mexican authorities say they’ll deport a portion of the 500 of the migrants who tried to enter America. Mexico said it would repair the damaged fence but would not deploy military forces to the border. 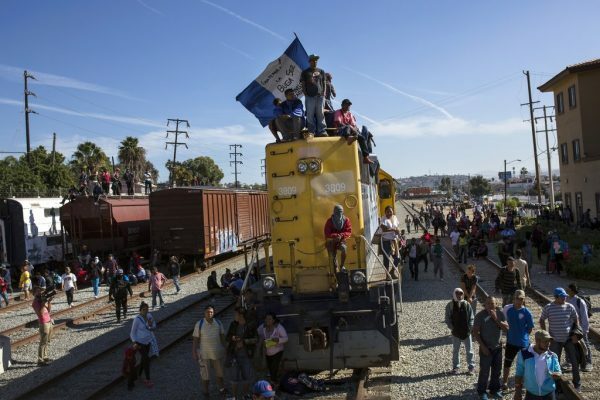 The border rush came as thousands of migrants streamed into Tijuana in the past week, triggering a humanitarian crisis, after some analysts wrongly claimed earlier in November that the caravans would never reach the United States. The Ministry of Interior said the main caravan has 8,247 people, with 7,417 of those located in Tijuana or nearby Mexicali. The other caravans with thousands of people each were still on their way to the border. The ministry said that migrants should accept the asylum offered by Mexico, noting that it includes work, health care, education, and other benefits. Migrants were offered temporary asylum under the program while they were in southern Mexico, but most migrants rejected the offer. On Sunday, Mexico’s Interior Ministry said that the country has sent 11,000 Central Americans back to their home countries since Oct. 19. Of that number, 1,906 were part of the caravans. The migrants, who are overwhelmingly young males, attacked Border Patrol agents by hurling rocks at them. The U.S. Customs and Border Protection (CBP) considers a rock a weapon. 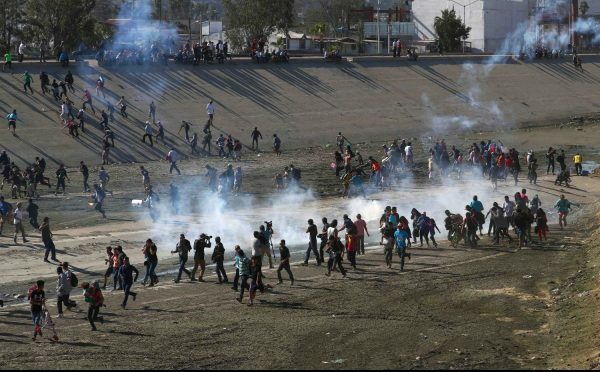 “Today CBP personnel were struck by projectiles thrown by caravan members. Such actions are dangerous and not consistent with peacefully seeking asylum,” said Department of Homeland Security Kirstjen Nielsen. “The perpetrators will be prosecuted. I will continue to aggressively support DHS personnel as they work to safely secure our border,” she said. She said that the government was forced to close the San Ysidro border port of entry because of the large number of migrants trying to illegally enter the United States. Some members of the caravan carried Honduran flags and yelled, “We are not criminals! We are international workers,” reported 10 News. Trump said that Mexico should deport the migrants. “Do it by plane, do it by bus, do it anyway you want, but they are NOT coming into the U.S.A. We will close the Border permanently if need be. Congress, fund the WALL!” he said in a statement on Nov. 26. Large groups of migrants have tried crossing the border before, with a group of more than 100 clashing with Border Patrol agents in November 2013. The Los Angeles Times reported at the time that agents were pelted with rocks and bottles, leaving several injured. “Agents said the incident harked to the days in the 1990s when migrants would run across the border en masse, in so-called banzai runs that would overwhelm agents,” the Times reported. 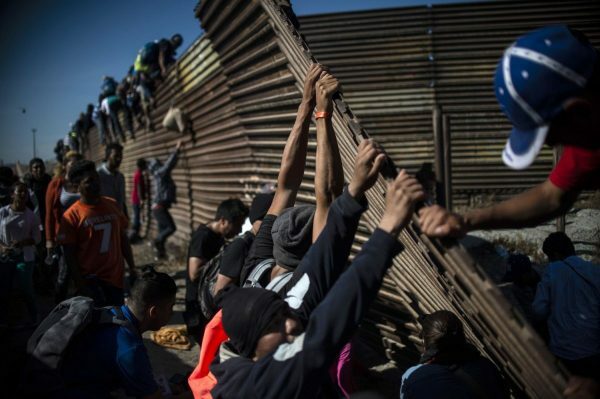 “As the crowd Sunday crossed the Tijuana River into California, more than one dozen agents responded to the border fence atop the levee and deployed pepper spray to hold them back, triggering the melee,” the report continued. In 2007, the Border Patrol said that agents were attacked nearly 1,000 times over a one-year period, prompting them to use tear gas and pepper spray. Officials said the tactics could save lives. Some migrants would hurl large rocks at agents to distract them as groups crossed the border. About two-thirds of the attacks were with rocks and most of the rest were physical assaults. Border Patrol Agent Joseph Ralph told The Associated Press that he had been hit by rocks 20 times between 1987 and 2007. “You find yourself trying to take cover,” he said. Another agent, Elley Taylor, was driving a vehicle when a large rock struck the hood of the car. “The only thing you can think is, ‘I’m glad that that wasn’t my head.’ There’s no way to see it coming,” Taylor said. A Border Patrol agent was killed by “rock throwers” in an ambush in 2017. Ralph said he suffered a broken shoulder blade while another agent in 2017 was rushed to the hospital after getting hit by a large rock in the chest.